Print out the template of choice. If using the black and white template, try printing it on red construction paper. 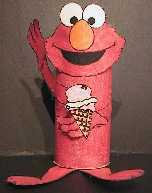 Glue the ice cream cone onto one of Elmo's hands if you feel like he's in the mood to indulge.